We were lucky enough to interview one of the worlds most respected analytics experts, Avinash Kaushik, fairly recently for our Internet Marketing Podcast. We were really pleased with how it went, we had some great feedback from our listeners, and Avinash enjoyed it so much he included it in a free CD that’s being bundled with his next book! Yet another reason to order it! 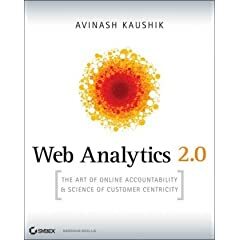 His next book Analytics 2.0 is a follow-up to the analytics bible that is Web Analytics: An Hour a Day. You can read all about the book over on it’s microsite, but as far as I know it’s the first published book on web analytics that really deals with the thorny issues of how to measure social media. If you can’t wait for the book to be available on amazon you should have a look at Avinash’s blog or have a read of these posts on the difficulty of measuring social media.